"This search resulted in discovery of two distinct quasi-periodic oscillation frequencies at about three thousandths and onethousandth of a second in the emergent radiation from Centaurus X-3, as well as the presence of a broad spectrum that extends to yet higher frequencies than have been found in any known collapsed object." "The quasi-periodic oscillation frequencies and the properties of the broad spectrum they discovered matched predictions of their theory for photon bubbles in Centaurus X-3, providing the strongest support yet for the existence of photon bubbles in X-ray pulsars." 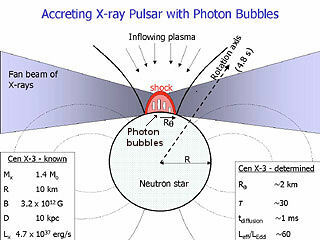 The image at left illustrates the theory of "Photon Bubble" formation at the magnetic poles of a neutron star. For a complete review see Discovery of kHz QPO from Cen X-3 from Sonoma State University website. 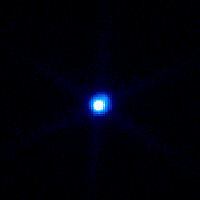 An Object query on star XTE J1739-285 at the Simbad website returned the following basic information: [KRL2007b] 258 Low Mass X-ray Binary. 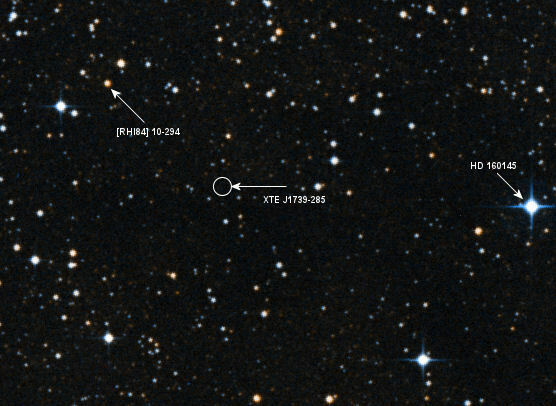 The [KRL2007b] 258 is the INTEGRAL/IBIS All-Sky Survey in Hard X-rays nomenclature or other designator for XTE J1739-285. The catalog's information is presented based on the standard description for astronomical catalogues which in this case, is for the survey information pre and post, conducted with the INTEGRAL satellite. "We present results of an all-sky hard X-ray survey based on almost four years of observations with the IBIS telescope onboard the INTEGRAL observatory." Which is the Abstract description given by the authors for their catalog. Another notable aspect about the pulsar's companion planet PSR B1620-26 b  it has been added to one of astronomy's most provocative and potentially impactful catalogs that currently exists: The Extrasolar Planets Encyclopaedia. The catalog was established in February of 1995 and "maintains a database of all the currently known and candidate extrasolar planets, with individual "note" pages for each planet and a full list interactive catalog spreadsheet." see Wikipedia. What are Extrasolar planets? The reality is that extrsolar planets are hard to detect and even harder to defintively catalog; just the implications of their name however, speaks oceans-full as to where science may be headed regarding these stallar objects. "To the astronomers' delight and surprise, images and spectra obtained with the ESO Very Large Telescope (VLT) now show a small nearby cone-shaped ("bowshock") nebula. 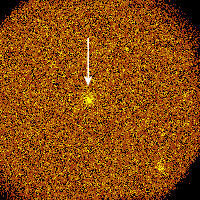 It shines in the light from hydrogen atoms and is obviously a product of some kind of interaction with this strange star. The shape of the cone is like that of a "bowshock" from a ship, plowing through water. 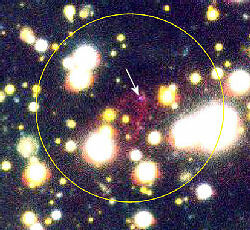 Similarly shaped cones have been found around fast-moving radio pulsars and massive stars, cf. e.g., ESO PR 01/97. 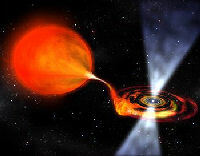 However, for those objects, the bowshock forms because of a strong outflow of particles from the star or the pulsar (a "stellar wind"), that collides with the interstellar matter." Image: "For clarity, a smaller area around the neutron star and the cone ("bowshock") nebula has been enlarged in PR Photo 23b/00 . 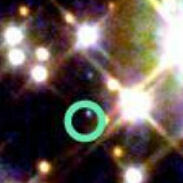 The object is at the centre of the circle and the neutron star is indicated with an arrow; the field measures 80 x 80 arcsec 2. North is to the lower right and East is upper right. 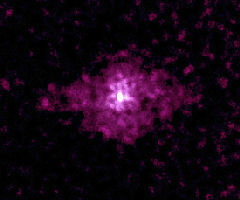 The motion of the neutron star as seen on the sky (see the text) is towards East, exactly in the direction indicated by the nebula." From the ESO website. While other surveys have been conducted in the intervening period ( e.g. K. Beuermann et.al., F. M. Walter et.al. ) RX J185635-3754 remained pretty much on the "theoretical minds" of astronomers in that it seemed to be the best canidate for another type of neutron star  a Quark ( Jeremy J. Drakea and Herman L. Marshall ). A quark star or strange star is a hypothetical type of exotic star composed of quark matter, or strange matter  for a brief overview of Quarks, see Wikipedia. But that thought was recently tested when the neutron speeder was surveyed using the ESA's X-ray space observatory XMM-Newton. 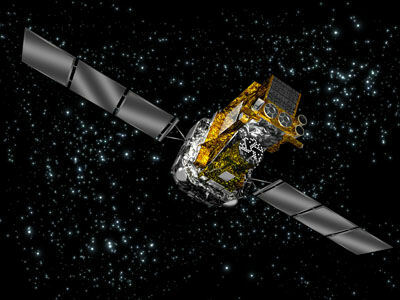 This orbiting observatory is the biggest scientific satellite ever built in Europe, its telescope mirrors amongst the most powerful ever developed in the world. There are many good reasons behind the efforts astronomers put into the detailed surveys of stellar objects such as neutron star RX J185635-3754. 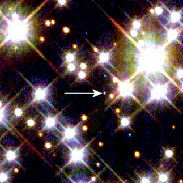 For starters, this star "is a key object in the study of its stellar category: it provides the second most perfect blackbody spectrum in the Universe, its distance and proper motion are measured, and the pulsations have the smallest pulsed fraction ever seen in an isolated neutron star. Until XMM-Newton's measurements, the knowledge of the rotation period was a missing key ingredient for the understanding of how these objects behave." 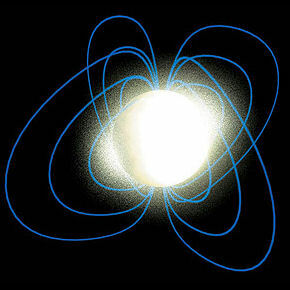 Secondly, "[n]eutron stars slow down because their strong magnetic fields (one million, million times larger than the Earth's field) and fast rotation, produce electromagnetic radiation that drains their rotational energy. Measuring the deceleration of the object would give astronomers a clue about its magnetic field, which is responsible for creating the hot spot that produces the pulsation." Credit: Image & text from the ESA. NASA Neutron Star, Turning Into Rare Ultra-Magnetic Object, Reveals Family Tree Credit: Dr. R. Mallozzi, University of Alabama, Huntsville & NASA. 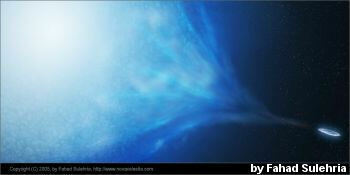 Pulsars - Imagine the Universe! at the NASA's Goddard Space Flight Center website, a service of the High Energy Astrophysics Science Archive Research Center (HEASARC), Dr. Alan Smale (Director), within the Astrophysics Science Division (ASD) at NASA's Goddard Space Flight Center. Calculating a Neutron Star's Density - from the RXTE Learning Center, a service of the Astrophysics Science Division at NASA/GSFC. Berger, Daniel J. Stars Copyright © 2001 by Daniel J. Berger. The above reprinting of Mr. Berger's work is under the following conditions: "This work may be copied without limit if its use is to be for non-profit educational purposes. Such copies may be by any method, present or future. The author requests only that this statement accompany all such copies. All rights to publication for profit are retained by the author." 3-D Fly-Through of Cassiopeia A text and video from the Chandra X-Ray Observatory website's Animations & Video: Supernovas & Supernova Remnants page. Crab Nebula & Pulsar quoted text from the SolStation.com website. © 1998-2008 Sol Company. All Rights Reserved. New Star Appears in Taurus by Von Del Chamberlain, from Project ASTRO UTAH. Determination of the Distance to the Crab Nebula by MATTHEW J. BESTER & MATTEO J. PARIS J. Undergrad. Sci. 3: 57-62 (Summer 1996) Astronomy. 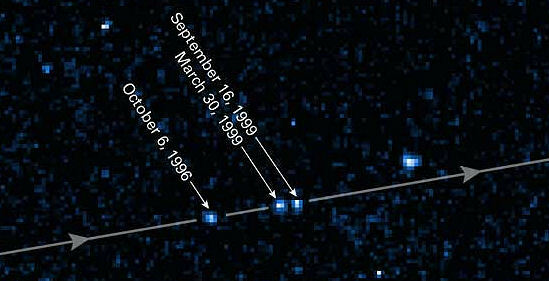 "In 2008, the general consensus is that its distance from Earth is 2.0 ± 0.5 kpc (6.5 ± 1.6 kly)." from Wikipedia. Messier 1, Supernova Remnant M1, (NGC 1952) in Taurus Crab Nebula from the SEDS website, Hartmut Frommert & Christine Kronberg, Last Modification: August 22, 2007. 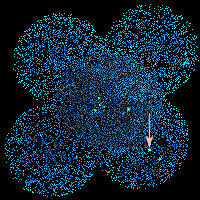 M1: Filaments of the Crab Nebula (Info) this is an excellent page of information on the Crab Nebula and it's Pulsar/Neutron Star. These were the primary sources for the quoted distance given to the Crab Nebula. Integral mission, a closer look at the Gamma Ray Universe from the Astronomy Today website, Author: Paul J. Henney. Copyright © 2000-2009, Astronomy Today. INTEGRAL mission report from 37th COSPAR meeting, Montreal, Canada 2008, European Space agency. File is in .pdf format. 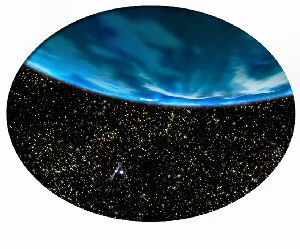 The ALADIN interactive sky atlas. A reference tool for identification of astronomical sources by F. Bonnarel, P. Fernique, O. Bienaymé, D. Egret, F. Genova, M. Louys, F. Ochsenbein, M. Wenger, and J.G. Bartlett, ASTRONOMY & ASTROPHYSICS APRIL I 2000, PAGE 33 SUPPLEMENT SERIES. This file is in .pdf format. Oldest Known Planet Identified HubbleSite News Release Number: STScI-2003-19 July 10, 2003, Credit: NASA, Brad Hansen (UCLA), Harvey Richer (UBC), Steinn Sigurdsson (Penn State), Ingrid Stairs (UBC), and Stephen Thorsett (UCSC). SEDS: Oldest Known Planet Identified in M4 from the Students for the Exploration and Development of Space website by Hartmut Frommert and Christine Kronberg. The Magnificent Seven in the dusty prairie The role of interstellar absorption on the observed neutron star population by B. Posselt - S. B. Popov - F. Haberl - J. Trümper - R. Turolla - R. Neuhäuser arXiv:astro-ph/0609275v1 11 Sep 2006. This file in in .pdf format. Astronomers Pioneer New Method For Probing Exotic Matter article from the NASA/Goddard Space Flight Center Newsletter of August 27, 2007. The XMM-Newton paper appeared in the August 1 Astrophysical Journal Letters. The Suzaku paper has been submitted for publication in the same journal. Centaurus X-3 page from Answers.com. Sci-Tech Dictionary. McGraw-Hill Dictionary of Scientific and Technical Terms. Copyright © 2003, 1994, 1989, 1984, 1978, 1976, 1974 by McGraw-Hill Companies, Inc. All rights reserved. Pulsating Radio Sources near the Crab Nebula Article, David H. Staelin and Edward C. Reifenstein III National Radio Astronomy Observatory, Edgemont Road, Charlottesville, Virginia. Science 27 December 1968: Vol. 162. no. 3861, pp. 1481 - 1483 DOI: 10.1126/science.162.3861.1481 © 2009 American Association for the Advancement of Science. All Rights Reserved. 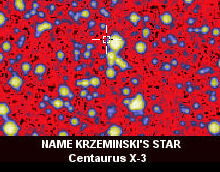 Integral points to the fastest spinning neutron star "Evidence for 1122Hz X-Ray burst Oscillations from the Neutron-Star X-Ray Transient XTE J1739-285", by P. Kaaret et al., will be published in The Astrophysical Journal on 10 March 2007 (http://arxiv.org/abs/astro-ph/0611716). 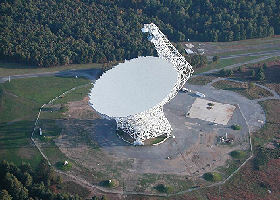 Discovery of Radio Pulsations from the X-ray Pulsar J0205+6449 in Supernova Remnant 3C 58 With the Green Bank Telescope by F. Camilo, I. H. Stairs, D. R. Lorimer, D. C. Backer, S. M. Ransom, B. Klein, R. Wielebinski, M. Kramer, M. A. McLaughlin, Z. Arzoumanian, and P. Müller Received 2002 March 8; accepted 2002 April 12; published 2002 April 24 The Astrophysical Journal, 571:L41L44, 2002 May 20 © 2002. The American Astronomical Society. All rights reserved. Printed in U.S.A.